I finished my first round of chemotherapy and coped pretty well with the treatment. Afterwards, I got my immune booster shot, which hurt! Then, I was allowed home. I loved being with my family again, even though people were careful around me and wore masks. Luckily, no visitors came over. With my ruined immune system, I can get sick very easily... and sure enough... four days after being home, I got a temperature and was in hospital again. They filled me with antibiotics, new blood and platelets - all because I got a cold! After the first round of chemotherapy, my hair fell out in chunks and my familys' hearts broke with every strand. 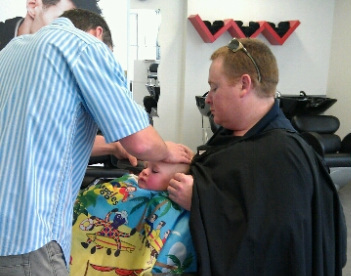 Mum and Dad took me to Mark, a local barber and had my head shaved. I now looked like a cancer patient. My beautiful eyelashes and my eyebrows became thinner and thinner, until they were pretty much gone. My second round of chemotherapy started on the 25th of July. I coped well with the second round and was an excellent patient. After my four days of chemotherapy, I was allowed home again. This month, I did not get very sick. I did have to go back to hospital for two days, to get a blood transfusion and another lot of platelets. I had several tests done in the middle of August and the oncology doctors have decided I will have another round of chemotherapy and then, they might look at cutting the tumour out of my liver. My third round of chemotherapy lasted only two days and they used different chemo this time. I loved my music therapy and enjoyed playing on my hospital bed - which makes noises every time I move! I was pretty sick for a couple of days after I came home, but I'm starting to feel better again. I ended up back in hospital, receiving more blood and more platelets. My fourth round of chemotherapy is finished and I have had a lot of mucus this time, so I have not been feeling very well. I did need a platelet transfusion, but... so far, I have not needed another blood transfusion. My head feels very soft at the back - because I am very bald there! My eyelashes and my eyebrows have lost a lot of hair, too... but, they will grow back. My fifth round of chemotherapy took place in November. It was another 96 hour treatment. I needed a little longer to recover from Round 5. I also needed two platelet transfusions. Round Six of my chemotherapy was another 96 hour round. It started on the 6th of December and I finished just after lunch on the 10th of December. I needed another platelet transfusion. My cancer count was 126,000 when I was first diagnosed with liver cancer. For someone my age, these numbers should be under 8. On the 10th of January, I had another CT scan. We found out that after 6 rounds of chemotherapy and my surgery, these numbers are down to 5! The day before my central line was scheduled to be taken out of my chest, I got an infection in the line. I spiked a temperature and Mum had to take me to Wollongong Hospital. My oncologists decided I needed to be ambulanced to Randwick. I was belted in to the car seat and tied into the trolley. Mum drove and met me in Sydney. Dad joined us there. On the 7th of February, my central line was taken out. When I woke from my surgery, my cords were gone! My chest was clear! Because of the infection, I spent a few more days in hospital before returning home. When the chemotherapy first started, we were told to expect at least four cycles, followed by surgery, followed by two more cycles. It seemed such a long time. 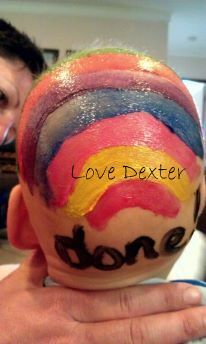 We were already so exhausted and we knew this would not change while Dexter was undergoing treatment for cancer... but, we knew we would make it through. We knew the risks associated with the type of chemo we chose for him – a high chance of secondary cancer developing with the longer exposure to one of the chemo drugs, as opposed to permanent hearing loss associated with the general chemo used for Hepatoblastoma. But he responded so well after the first round – even the Oncologists were amazed. His alpha fetoprotein levels (tumour markers) were dropping. 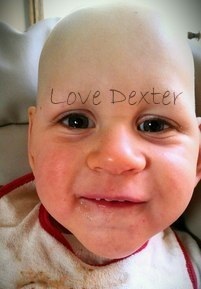 An average infant Dexter’s age has a level under 8. His were 126,000. After round one, it went to 6000. The day round two of chemotherapy started, it was at 4500. At the end of round two, it went to 2400. And it is currently at 412. The tumour is shrinking – dramatically shrinking. It is becoming harder to feel. And he is feeling better. He is happy; he doesn’t sleep as often as he did pre-cancer; he is active. His levels have decreased and yes, the tumour has shrunk, but not enough. He needs at least another round of chemo before they will operate on him. The third round of chemotherapy is due to start on Thursday. 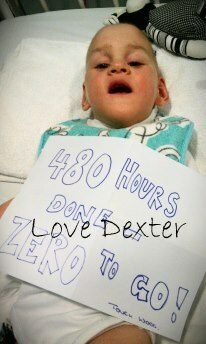 Dexter finished 6 rounds of chemotherapy - 480 hours.